I just got a 'Pro' and now building my own script for a Novation Launchpad Pro. I'm thrilled, great concept, works fine for now. Thanks to John for all your effort and the great thing you made up to now! With the original scripts for Launchpad Pro, LP mk2, APC20/40 mk2 and Push the controllers' LED matrix shows me the respective colour of the particular Ableton Clips. But right now it either shows me the unmapped standard colour or the set custom colours - both for each clip the same, independent from the Ableton clip colours. Did I just miss the way to achieve this with Remotify or is it simply a missing feature yet? If so - when could it be there in the future? I'm really craving to use a selfmade remotify script on my gigs all over, but it wouldn't work for me without this feature. Welcome to the world of Remotify Pro and thank you very much for the very kind words! Yes, clip colour feedback has been requested and we're currently investigating how to implement it into the App. The main issue is that every controller has a different set of velocity values to display its colours so we have to take various scenarios into consideration. Thx for the reply and great to hear that it's coming up. Could you estimate, when it could be done approximately? This is still a little while off being implemented. In the meantime I can provide you with custom code for you to add to your script which will give you this functionality. Its probably going to require a bit of back of and forth to get this working but will get you up and running quicker. I'll document the steps into a guide for anyone else who needs this too. So I'll just send you my remotify script right here and you'll add some code to it? So that everyone can replicate, the way I prefer to do these 'beta' code snippets is to give people the piece of code and a short guide on how to add it to their script themselves. Phranky, I'll send you an email very soon. I have some code for the Launchpad Pro for you to try out. Mcbeat - only for the Launchpad pro at the moment. The f1 will most likely require its own version to work. I'll let you know when I have something. Hey John :) Did you already send an email? Didn't receive anything yet. You have my adress, right? Looking forward to it, thanks in advance! I don't have a Launchpad Pro, but I just want to reiterate on behalf of everyone how wonderful - and refreshing - your "We_don't_do_that-Here_you_go" attitude is. Whether or not what your app does is easy for you to do, it's an AMAZING leap forward for us controller users who want our controller to JUST DO THINGS and don't *want to* or *know how to* or *want to know how to* make it do those things. This example, where instead of saying, "We're working on it, wait for the release and good luck" you are actually saying, "Here's a solution for YOUR specific problem and hopefully we'll add this in the future." By the way, I can confirm that the launchpad pro code worked and he now has clip colours which correspond to the colours inside Ableton. 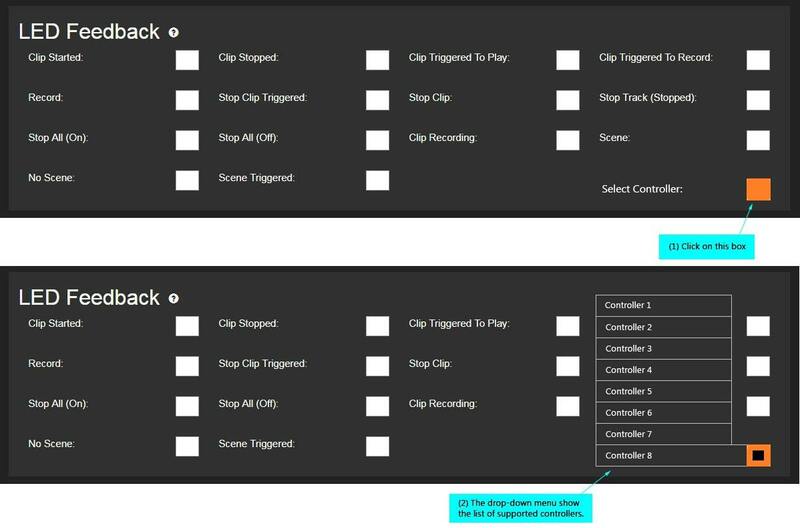 It's specific to this controller only at the moment but if any pro members would like to add this functionality to their script then send me a message and I can pass you it. Yeah sorry for being so quiet here. It works fine, also tested in several stage/live conditions - thanks a lot John! Great to hear that you've test it live too! regarding adding this into the app, for now this is on hold until we figure out a solution that would work for any LED enabled controller. Hey John, is there any way you could pass this script on to me? I'm using an APC40 MKII and would love to have the LED colors match Ableton's. but it only works for the Launchpad pro, so wouldn't be of any use for the APC. If you would still like the script, let me know and I'll pass it over to you. So I see this issue is being handled, I have a livid baseII and a traktor f1 both have rgb pads, do you have scripts for those? Hi John, is the clip colours feature already implemented into the editor app? I´m interrested in the rgb clip color code too. Which controllers do you need this for? Once we start implementing this into the App it would be good to know all of the controllers we need to cover as each one will most required its own custom code to achieve. Could you also send me the code please? I'll try to adapt the color scheme of the Launchpad to my own controller.